May I read to ye afore ye sleep? ‘Shakespeare’s Rebel’: the Audio Book | AUTHOR. ACTOR. SWORDSMAN. ← When a Rebel’s reviewed: God Praise the Bloggers! Over the years there have been a few occasions when I’ve have been asked to come to a person’s house, enter their bedroom… and read them to sleep. Sometimes I felt that reading was not what they had in mind. However, I could be wrong. And now all those lovely people have the chance – to hear my voice ‘ere bed, at least. 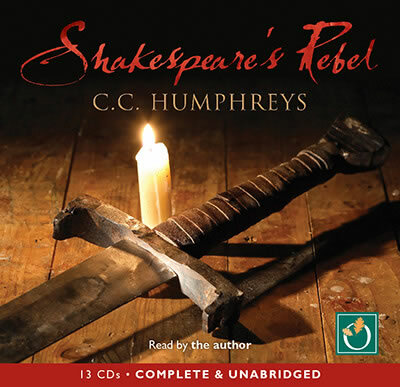 For the audio book of ‘Shakespeare’s Rebel’ is now out. Oh dear! Well, needs must I suppose. I suffered for my art, consoled myself with my favourite drink – English Extra Special Bitter. Truly, its never a hardship to spend time in the city I grew up in. I discovered something very interesting when I began to record the audio book of my first novel, ‘The French Executioner’: I write to be read aloud. Preferably by me. I suppose its not a huge surprise being an actor, but my writing is… performable. So for 3 days I went to a small terrace house in Chiswick, West London, where the wonderful Douglas Keen has his studio. Douglas is a former rock musician who always dabbled on the technical side. When the rock and roll life got a little too much, he moved into audio book recording. He was terrific, letting me run if I kept going, putting me straight back on track in seconds if I stumbled. Its intense work, sitting in a claustrophia inducing booth for 8 hours, talking continuously but he made it easy and fun. So I may not be able to join you in your boudoir and read to you tonight. But if you just click on this link, and pay a modest fee, my voice will be with you very soon. This entry was posted in Uncategorized and tagged acting, audio books, author, books, historical fiction, novels, shakespeare, writers. Bookmark the permalink. I look forward to nodding off accompanied by your dulcet tones… 😉 I know what you mean about writing for reading aloud – I’m a spoken word performer, I can’t *not* do that… And of course the best test of writing is to to * read * it * aloud * – that’s when you find the snake length sentences and the grammar that’s tied itself in knots!